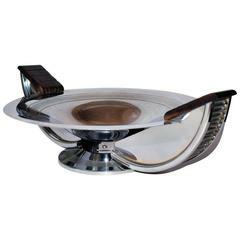 Very stylish 1930s modernist chrome coupe fruit bowl. Originating from France, this comport would make a great centrepiece to any table setting. The pedestal is walnut which contrasts beautifully with the chrome. Ideal for your dinner table or side table. Modernism era. French Art Deco modernist fruit bowl, circa 1930. Modernism era. In Macassar wood and chromed metal.